Skincare manufacturers are fast to shout about the benefits of their products. But have you ever stopped to consider how a product can be so potent that it can change the natural pathway of your skin cells? While manufacturers are talking loudly about the benefits of their products, they’re not always so fast to talk about the formulating ingredients that are the essence of many so-called- miracle products. That Australian Competition and Consumer Commission (ACCC) is the regulatory body responsible for fair trading for the benefit of all Australians. What this means is that while labelling regulations do exist, consumers are essentially bound by trust to the manufacturers who take their money. Trust that their processes are accurate. Trust that ethics overrule their desire to make a fast dollar. And trust that our existing products aren’t slowly but surely, making us sick. With such loose regulations, we already know that you’ll never see ‘known carcinogen’ or ‘cancer-causing’ written on a label. 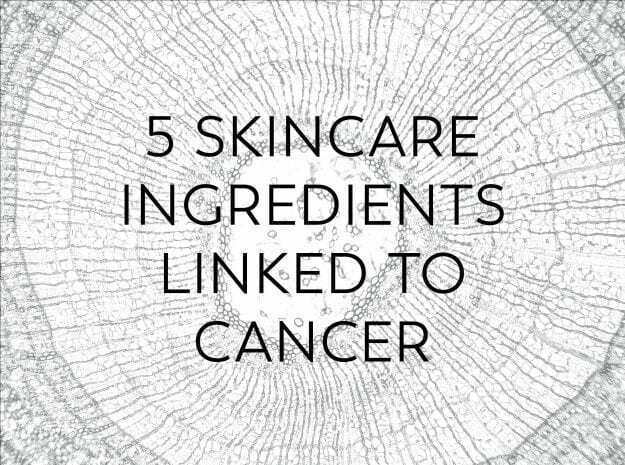 Which in some cases may be a little misleading, because many ingredients used in skincare across Australia today do contain cancer-causing properties. Fact. But if you’re not a scientist, how would you know that? The only way you can really take control of what you put on your skin is to do your own research and make your own decisions. The following ingredients are ingredients with proven carcinogenic links that may be found in everyday skincare products that you might have sitting on your bathroom shelf. While it’s not concrete evidence to show that a pot of moisturiser causes tumours, and other factors must be considered, the EU has banned these harmful ingredients in skincare. While many companies are getting ethical in their ingredients and claiming to be ‘paraben-free’, many aren’t. But with the ACCC not carrying out any testing on products, believing those that don’t use parabens all comes down to trust. In 2016, triclosan was banned in cosmetic products in America as there is insufficient data on the safety of the chemical ingredient. Worse than that, because they’re a derivative of coconuts, this carcinogenic ingredient can also be labelled ‘naturally derived’. There are very few long-term studies on the long-term downside of exposure to known carcinogens in skincare, so the best we can do is learn about the ingredients and work backwards to make our own choices. Some ingredients may be toxic depending on the concentration, and safe in other levels and forms. Whether it’s used topically or orally may also make a difference. Always do your research and choose your health above all else. Whether or not your risk of cancer will increase from cosmetic use alone remains to be seen. What deserves our concern is that over time, these harmful ingredients will build up and may pose a long-term risk. With lack of substantial evidence on the regular use of known carcinogens in cancer, do you really want to use ingredients that can be absorbed directly into your bloodstream? The good news is that now you have a choice. Biologi is a chemical free, all-in-one skincare serum that hydrates, reduces the signs of ageing, evens out pigmentation and gives your skin a luminous glow. Biologi serums alleviate the need for moisturisers, eye cream, face masks and many other products that contain cancer-causing ingredients. Do your own long-term study about how natural products get results safely, click here to buy Biologi today.